Camille enters the stage dressed in Cave-like attire – black suit, white shirt, untied black tie – albeit with the addition of sparkly, heeled boots. From the opening number “God is in the House” she is up close and personal with the audience, whispering and crooning lines to members of the front row. Her Irish pronunciation gives an extra level of meaning to this tune about blind faith and small town-life. She pushes on, through gorgeous renditions of torch songs “Still In Love”, “People Ain’t No Good” and “Into My Arms”. However, she’s not afraid to get into the meatier side of Cave’s work. She channels Patti Smith to snarl through a high-energy version of “There She Goes”, “My Beautiful World” and then launches into an astounding rendition of “Stagger Lee” – Cave’s hyper-masculine, hyper-sexualised reworking of the blues classic. Afterwards she sits on the edge of the stage and jokingly admits ‘as a Catholic, I have to cross myself after that one’. She kicks her boots off and performs barefoot as she does “Red Right Hand” – making it effortlessly sultry and menacing and apocalyptic. The band – drums, keys, guitar and and a multi-instrumentalist switching between violin, sax and saw – are absolutely on point throughout. Camille conducts them at times to play louder or softer; you get the feeling she might still be working through exactly how she wants certain parts arranged – but this doesn’t detract at all. During “Darker with the Day” she points at the lighting technician and drags her hand downwards; the lights on the stage magically dim, leaving her in silhouette, and for a moment it seems that she is controlling the stage as easily as lowering the brightness on her iPhone. She finishes with an emotional rendition of “The Ship Song”, complete with audience singalong. She climbs down into the audience and sings with us, while the band hold hands on stage and harmonise. It’s a lovely moment in an evening of lovely moments. It’s a virtuoso performance from an artist who is clearly in love with the material. She brings her own take to each of the songs, and sings them as they are meant – as stories – bringing nuance and new meaning to each individual line. Whether you’re a Cave fan or not, this is a showstopping night from a performer at the top of her game. I might go again tomorrow. 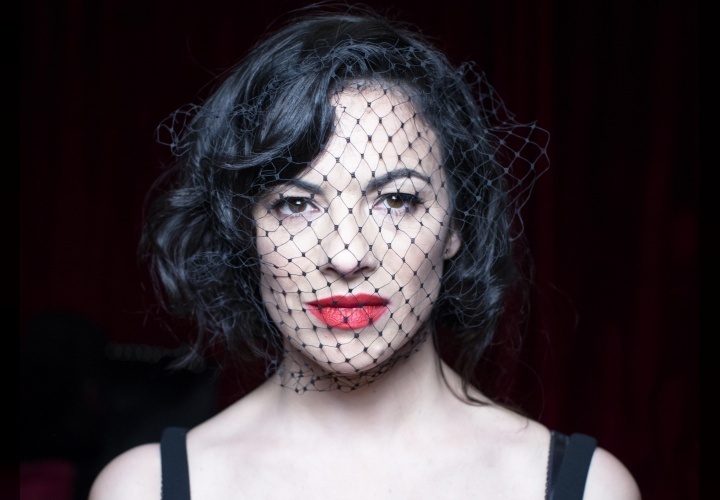 Camille O’Sullivan – Cave runs through 13 April.